Current artistes and performers were also once students of basic music concepts, which brought them to their chosen art form. 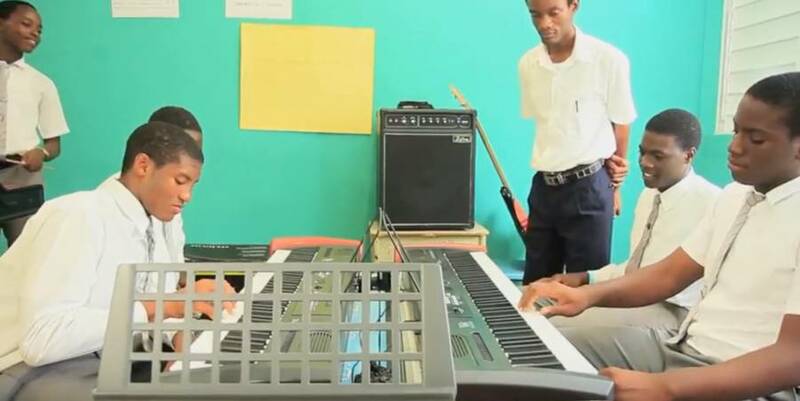 Past students of Boca Secondary School; Wilt “Tallpree” Cambridge and Andew “ Simple Dan” Noel, both acknowledge the influence that access to music, which they were exposed to through the school curriculum, has played in the their lives. Just over a year ago, Richard Strachan, Managing Director of Netherlands Insurance took further steps to see where assistance in exposing young persons to basic music education. Mr Phil Beaman, President of the National Music Teachers Association was approached and asked to submit a proposal geared towards preparing students for the music CXC exams. This exam level Caribbean syllabus has been in place for over 20 years with less than 12 students. “The approach to Mr Beaman came from a recognition of falling standards in music, a direct result of a lack of thorough basic training for potential musicians. Boca Secondary School seemed the ideal place to start as it already had a dedicated music room and teacher. In discussion with their faculty it became readily apparent that their emphasis has always been geared towards the holistic development of students, and as such music has been an integral part of the school curriculum” stated Mr Strachan. “Even if a student Is not musically inclined, exposure to the subject at secondary school level has been proven to be beneficial to both academic and general development” he added. Just 1 year after the implementation of the programme, Boca Secondary School has seen an almost 100% pass rate, with 80% distinctions, from students who sat the UK Associated Boards of Royal Schools of Music exam (ABRSM). “Our goal is to see a full class of students sit the CXC music exam for the first time. Students are learning that contrary to popular belief, this exam syllabus is not based solely on classical music, but that it includes the study of genres of music such as calypso, reggae and dub, with the goal of furnishing students with a basis in music which will allow them to pursue their chosen specialty anywhere” stated Mr Beaman. “Tallpree” and “Simple Dan” agreed that the steps taken by Netherlands Insurance to become even more involved in developing home grown talent is both timely and praiseworthy, and will play a part in nurturing the future musical talent of Grenada. They thanked Netherlands for their vision and for taking the action to make it become a reality, starting with their alma mater, Boca Secondary school for the Model Secondary School Programme. Netherlands thanks both artistes for their words of support and wishes them continued success.